Despite their vaunted status, many of the greatest golf courses in the world can inspire frustration, rage and awe in even the best players; some inspire all three at the same time. Ask any Tour pro or celebrity amateur golfer for their opinion about a Top 100 golf course and you usually elicit a funny, clever or occasionally nasty retort. 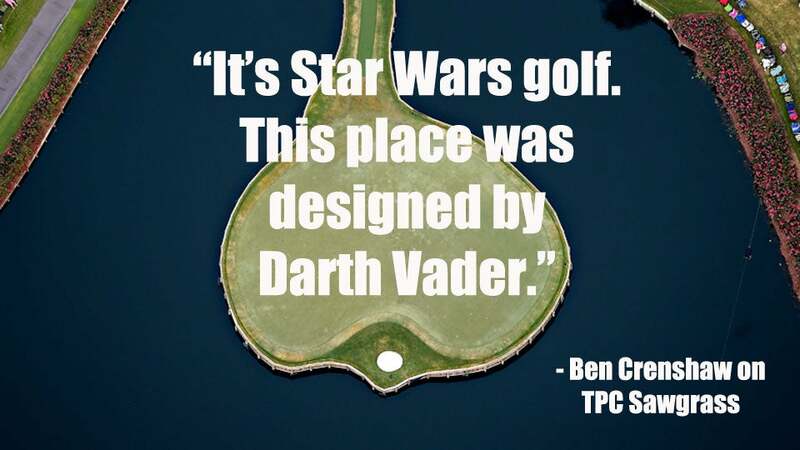 Here are some of the best quips ever about our greatest courses. Merion Golf Club (East), Ardmore, Pa.
Whistling Straits (Straits), Haven, Wisc. When Lee Westwood first saw the course he said, “I'd been told there are 10 difficult holes and eight impossible ones. I'm still trying to work out which the 10 difficult holes are." Spyglass Hill Golf Course, Pebble Beach, Calif. When asked during the 1970 U.S. Open what the course lacked, Dave Hill famously responded, “Eighty acres of corn and a few cows. They ruined a good farm when they built this course." Oak Hill Country Club (East), Rochester, N.Y.
Pine Valley Golf Club, Pine Valley, N.J. Winged Foot Golf Club (West), Mamaroneck, N.Y.
Jack Nicklaus was once asked to rate a handful of classic courses on a scale of difficulty from 1 to 10. He rated Augusta National, Oak Hill, St. Andrews and Seminole all 8s. Baltusrol and Pebble Beach merited a 10. How about Winged Foot, Nicklaus was asked. “11," responded Nicklaus. “Maybe 12." Fishers Island Club, Fishers Island, N.Y.
Prairie Dunes Country Club, Hutchinson, Kan.
After weeks of tromping around the yucca-choked sandhills of Hutchinson in the 1930s, architect Perry Maxwell pronounced, “There are 118 good golf holes here. All I have to do is eliminate 100 of them." Twenty years after Donald Ross designed Aronimink, he visited the layout and declared, “I intended to make this course my masterpiece, but not until today did I realize I built better than I knew." Oakland Hills Country Club (South), Bloomfield Hills, Mich.
Pinehurst (No. 2), Pinehurst, N.C.